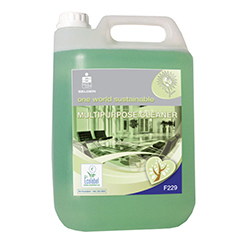 All purpose cleaning concentrate, ideal for removing soil, grease and heel marks from all synthetic floors. Suitable for use on all non-porous surfaces. Controlled foam helps prevent over use. Concentrated eco-friendly formulation. For cleaning floors in offices, schools, hospitals, canteens etc. Suitable for use on linoleum, PVC, rubber, sealed wood, sealed cork and thermoplastic floors. N.B. Not recommended for laminated flooring or unsealed wood and cork. For light cleaning dilute 1 part to 100 parts hot water. For general cleaning dilute 1 part to 50 parts hot water. For heavy duty cleaning and spray burnishing dilute 1 part to 30 parts hot water. For heavy duty degreasing dilute 1 part to 10 parts warm water. Proper dosage saves costs and minimises environmental impacts. Composition A buffered blend of surfactants.